If the transmission encounters an electrical componentmalfunction, the transmission will default to Fourth gear. Allsolenoids will default to their normal state. If the torqueconverter clutch is applied, it will release. The transmission willremain in Drive Range– Fourth Gear Default until thecondition is corrected. Reverse (R) range can also still beselected. This default action enables the vehicle to be safelydriven to a service center. The 1234 PC solenoid defaults to its normally-high state(ON), allowing actuator feed limit fluid to enter the PCS 1234clutch fluid circuit. PCS 1234 clutch fluid is routed throughorifice #20 to the 1-2-3-4 clutch regulator valve, and throughorifice #17 to the 1-2-3-4 clutch boost valve. If the transmissionis operating in Fifth or Sixth gear when an electrical malfunctionoccurs, the 1-2-3-4 clutch will apply. If the transmission isoperating in First, Second, Third or Fourth gear when theelectrical malfunction occurs, the 1-2-3-4 clutch remainsapplied. PCS 1234 clutch fluid pressure acts on a differential area,moving the 1-2-3-4 clutch boost valve against 1-2-3-4 clutch boostvalve spring force, to block 1234 clutch fluid from entering the1234 clutch feedback circuit, and opening the 1234 clutch feedbackcircuit to exhaust backfill. This results in the 1-2-3-4 clutchregulator valve moving to the full feed position, sending full 1234clutch feed pressure (full line pressure) to the 1-2-3-4clutch. PCS 1234 clutch fluid moves the 1-2-3-4 clutch regulatorvalve, against 1-2-3-4 clutch regulator valve spring force, to theapplied position. This allows drive fluid pressure to pass throughthe valve into the 1234 clutch fluid circuit. The 1234 clutch fluidis then routed to the 1-2-3-4 clutch boost valve and throughorifice #19 to the 1-2-3-4 clutch. 1234 clutch fluid enters the transmission case assembly andmoves the 1-2-3-4 clutch piston against spring force to apply the1-2-3-4 clutch plates. The R1/456 PC solenoid defaults to its normally-high state(ON), allowing actuator feed limit fluid to enter the PCS R1/456clutch fluid circuit. PCS R1/456 clutch fluid is routed throughorifice #11 to the R1/4-5-6 clutch regulator valve, and throughorifice #34 to the R1/4-5-6 clutch boost valve. If the transmissionis operating in First, Second or Third gear when an electricalmalfunction occurs, the 4-5-6 clutch will apply. If thetransmission is operating in Fourth, Fifth or Sixth gear when theelectrical malfunction occurs, the 4-5-6 clutch remainsapplied. PCS R1/456 clutch fluid pressure acts on a differential area,moving the R1/4-5-6 clutch boost valve against R1/4-5-6 clutchboost valve spring force, to block R1/456 clutch feed fluid fromentering the R1/456 clutch feedback circuit, and opening the R1/456clutch feedback circuit to exhaust backfill. This results in theR1/4-5-6 clutch regulator valve moving to the full feed position,sending full R1/456 clutch feed pressure (full line pressure) tothe 4-5-6 clutch. PCS R1/456 clutch fluid moves the R1/4-5-6 clutch regulatorvalve, against R1/4-5-6 clutch regulator valve spring force, to theapplied position. This allows line fluid pressure to pass throughthe valve into the R1/456 clutch feed circuit. R1/456 clutch feedfluid is then routed to the clutch select valve, the R1/4-5-6clutch boost valve, and through orifices #9 and #12 to the springend of the R1/4-5-6 clutch regulator valve. When the R1/4-5-6clutch regulator valve is in this position, latch fluid exhauststhrough the valve allowing 456 clutch fluid to shuttle the #1 ballcheck valve. Orificed 456 clutch fluid pressure seats the #1 ball checkvalve against the exhausting latch fluid passage. 456 clutch fluidis then directed into the latch circuit to replace the exhaustinglatch pressure and is routed to the clutch select valve. Latchfluid combines with clutch select valve spring force and holds thevalve in this position during all six forward gear ranges. R1/456 clutch feed fluid passes through the clutch selectvalve and enters the 456 clutch circuit. 456 clutch fluid is routedto the 4-5-6 clutch assembly, and through orifice #2 to the #1 ballcheck valve. 456 clutch fluid enters the 3-5-reverse and 4-5-6 clutchhousing assembly, and moves the 4-5-6 clutch piston against springforce and exhaust backfill pressure to apply the 4-5-6 clutchplates. If the transmission is in Third or Fifth gear when anelectrical condition commands a protection mode, the 35R PCsolenoid defaults to its normally-low state (OFF), allowing PCS 35Rclutch fluid pressure to exhaust and the 3-5-reverse clutch torelease. See Drive Range– Fourth Gear for a completedescription of 3-5-reverse clutch release. 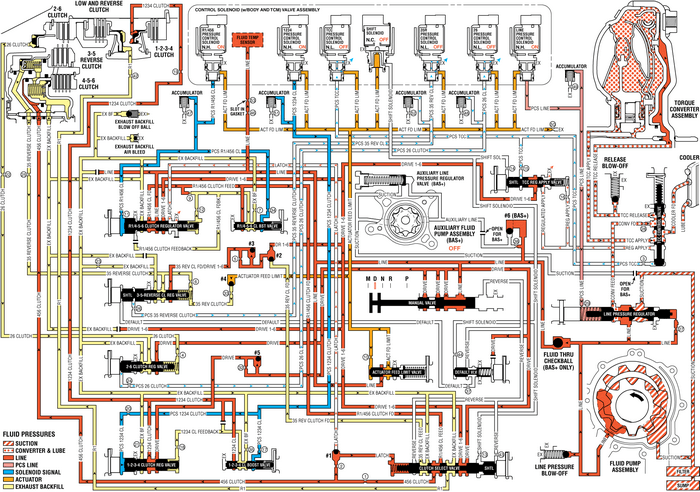 If the transmission is in Second or Sixth gear when anelectrical condition commands a protection mode, the 26 PC solenoiddefaults to its normally-low state (OFF), allowing PCS 26 clutchfluid pressure to exhaust and the 2-6 clutch to release. See DriveRange– Third Gear for a complete description of 2-6clutch release. If the TCC is applied when an electrical condition commands aprotection mode, the TCC PC solenoid defaults to its normally-lowstate (OFF), allowing PCS TCC fluid to exhaust and the TCC torelease. See Drive Range– Sixth Gear for a completedescription of TCC release.